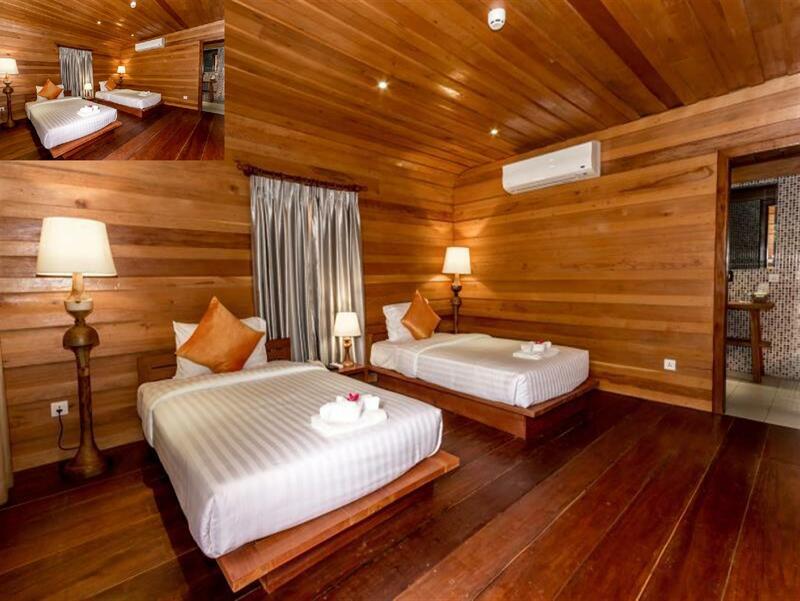 Té alguna pregunta per a Angkor Heart Bungalow? Situat a Centre Conservació de la Tortuga Marina Sattahip, Angkor Heart Bungalow és el lloc perfecte per gaudir de Siem Reap i els seus voltants. El centre de la ciutat és només a 2 Km i l'aeroport és només a 10 minuts. Gàcies a la seva bona ubicació, des de l'allotjament es pot accedir fàcilment a les visites obligades de la ciutat. 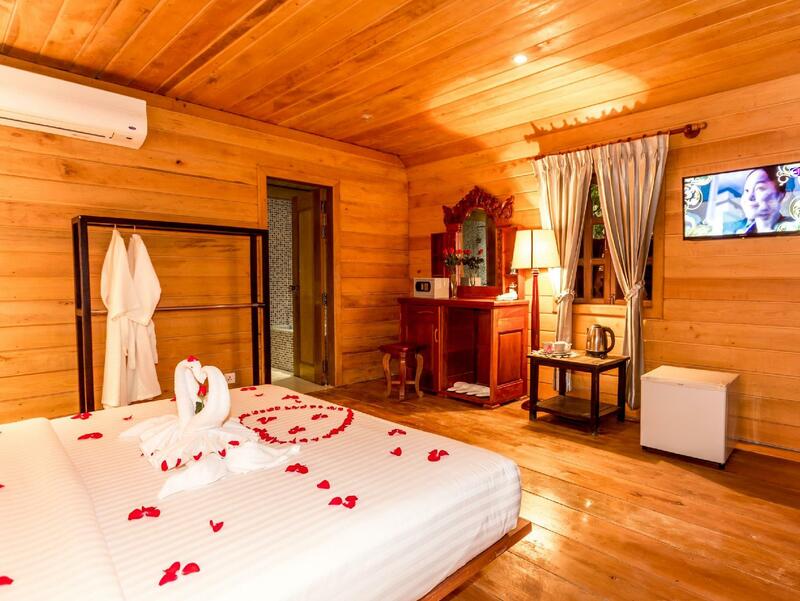 Angkor Heart Bungalow també ofereix moltes instal.lacions per enriquir la seva estada a Siem Reap. Aquest hotel ofereix nombroses instal.lacions en el lloc per satisfer el més exigent dels clients. L'ambient de Angkor Heart Bungalow es reflexa en cada habitació. televisió de pantalla plana, productes de neteja, cafè instantani inclòs, te inclòs, beguda de benvinguda gratuïta són només algunes de les comoditats a la vostra disposició. L'hotel ofereix una excelent varietat d'instal.lacions d'oci, incloent bany, piscina exterior, massatge, jardí. Les seves instal.lacions de primera i una situació excelent fan de Angkor Heart Bungalow la base perfecta per a gaudir de la seva estada a Siem Reap. Les distàncies que es mostren són en línia recta segons la ubicació al mapa. Les distàncies reals poden variar. Gratuït si s'usen els llits existents. En cas de necessitar un llit supletori, aquest suposarà una despesa addicional. Es consideren adults els nens a partir de 6 anys. Han d'utilitzar un llit supletori, el que suposarà una despesa addicional. Conjunto de bungalows en una zona tranquila. Personal excelente, pendientes en todo momento en hacerte sentir especial. Bungalows totalmente reformados y muy amplios con buena terraza tranquila. Servicio de tuk tuk gratuito para llevarte al pueblo. Organizan el tour a angkor a precios muy populares (20 y 15 dolares)" en funcion recorrido). Desayuno a medida muy abundante. Volveria sin dudarlo. Li ha semblat útil aquest comentari? El personal del hotel fue muy cordial, siempre estaban pendientes de nosotros, nos ayudaron a coordinar transportes y cuando llegabamos en la tarde, siempres nos llevaban alguna fruta o bebida. Las habitaciones muy amplias y comfortables. La porción del desayuno es bastante grande. Aunque el hotel esta retirado del centro, ofrece servicio grauito de tuk tuk hasta allá. Nosotros estuvimos 4 dias .El hotel es perfecto para pasar unos días . El personal muy amable . Habitaciones muy limpias y cómodas. Esta a 5 min en tuk tuk de Pub Street pra cenar , copas etc . Y desde el hotel te ponen un tuk tuk gratuito al dia . Desde nuestra llegada nos hemos sentido enormemente acogidos en estos Bungalows. El atendimiento es muy bueno. Los recomiendo. Excellent service and they serve coconuts when you return back in the evening. Friendly and helpful staff. Generous breakfast spread and fuss free tour arrangement and driver. Do engage the patient and friendly driver, Chin Sothea, who knows the places well and can take good photographs for you. He can speak English too. THE BEST! Thank you to Mr. Changtri and all the staff. They were very accommodating and nice! Had the best time at Angkor Heart. Everything was perfect. Good food too! Location is a bit far from Pub Street but if you want to just chill by the pool and a quiet place to stay at, this is perfect. Thanks to Mr. Chaang too, very nice tuktuk driver! I truly enjoyed my stay, even more than the previous time. Thank you Sopheap and Sina for the wonderful service. The staff really put guest needs as their top priority. Good breakfast, clean room, clean swimming pool, secluded environment, good service - always with a smile... What else can I ask for more :) Every time when we come back, we are greeted with a big smile and coconut drink. It's really like going home. We felt so welcome! Yes, this will be my home for my next visit. The hospitality and level of care that every member of staff provides their guests is impeccable! For one morning I had the local noodle soup. I like my food spicy so I asked for fresh cut chillies. The next morning, I got my chillies without asking! The pool is great, long enough for swimming, with floats you can use. Only thing was way too many dead insects in the pool! (I took a dip at 5pm) Bugs are unavoidable, but perhaps the hotel can clean the surface for bugs a few times a day. The whole place was so cosy, it felt like home. Chickens run freely around (they even join you at breakfast!). Bungalows are small, but you've got everything you need. No mozzies indoors too. If you sleep early or like total peace and quiet, the hotel is near the circus which performs until past 9pm. The drums are loud. We stayed in bungalow 1, which was nearest the main road. Could hear traffic going past. Hopefully the other rooms are quieter cos if so, I will definitely stay here again! Stayed here for 3 nights. Complimentary airport pick-up was included. Upon arrival, the tuktuk driver was already waiting for us. His name is Mr Bean. He was also our tuktuk driver when we had our last day tour. Very kind person and his service was great. When we got to the hotel, we were checked-in inside our room. Welcome juice and cold towel were given. Ms Ceena (I’m not sure of the spelling) was very accommodating. We really love the resort. It was very private. They always served us fresh coconut juice when we get back from the tour. We had lunch and dinner at the resort and the food was amazing. During our last day, they granted our request to take a shower before going the airport. Definitely recommending this hotel and will stay here again! WE stayed in several hotels during our stay in Siem Reap and this hotel was number one for hospitality and 'care'. Its different to the standard hotel stay with your stay focused in your own private bungalow surrounding a large, super clean pool. Lots of friendly service and extra touches as departure gift. When we were leaving for the early morning Angkor Wat visit, they packed an awesome breakfast to take with tinned coffee (better than it sounds!) Experience was like staying at a homestay with excellent pool and your own private house. Renovated bathrooms were a great surprise - so modern. You must stay at Angkor Heart while in Seam Reap. The bungalows are beautiful and are only exceeded by the amazing staff. 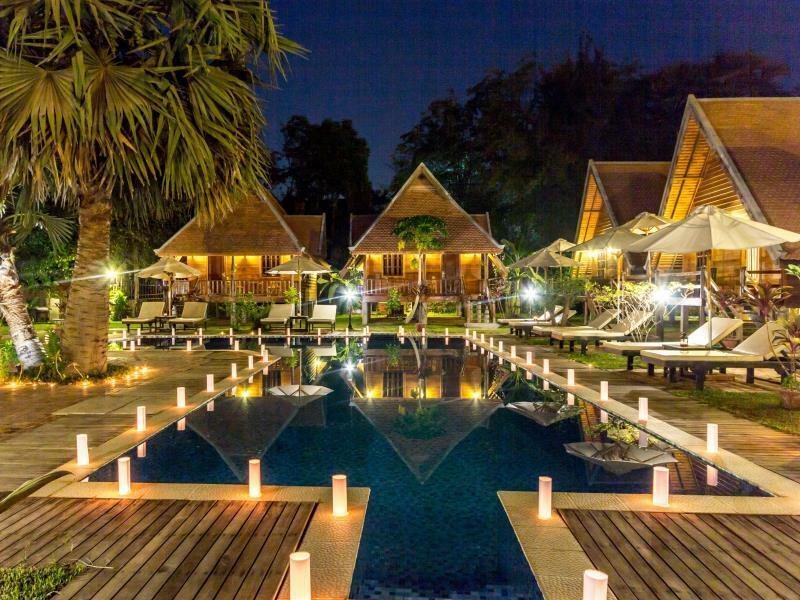 It is a 20 minute walk or $US3 tuk-tuk to Pub Street, plus they have a complimentary evening service. A cold coconut by the pool in the afternoon was a bonus. We had a really wonderful time here. Lush grounds with two pools. Staff works hard to meet your every need. 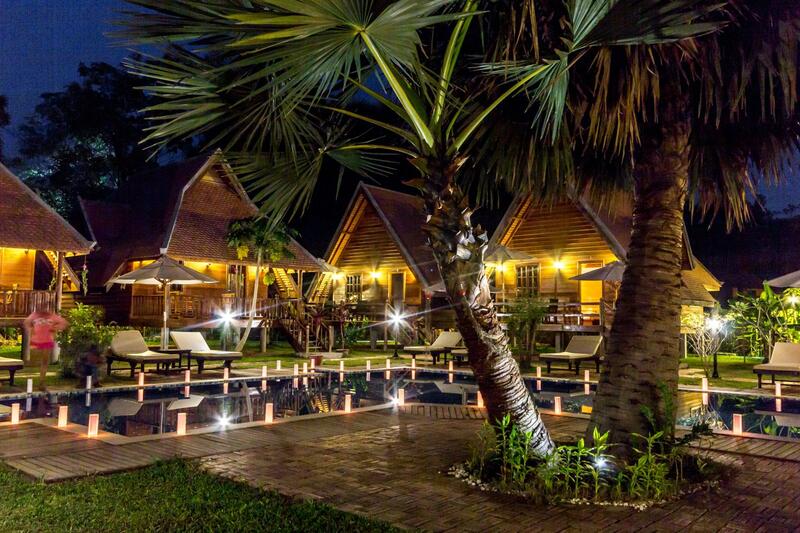 It’s located far enough from town center’s hustle and bustle but only 5 minutes away by Tuktuk. And hotel provides free transportation into town center free from 5to 9pm. The bungalows are beautiful, and the welcome and service from the staff was excellent. Breakfast was served on our balcony, and we were greeted with coconut water and fruit from the garden each day. They also provide a take-out breakfast box if you have an early start which was much appreciated. The pool and grounds are well maintained. It's a bit further from Siem Reap's centre (Pub Street/Night Market) but they provide you with a free tuk-tuk ride into the town, and it's just $3 to come back. 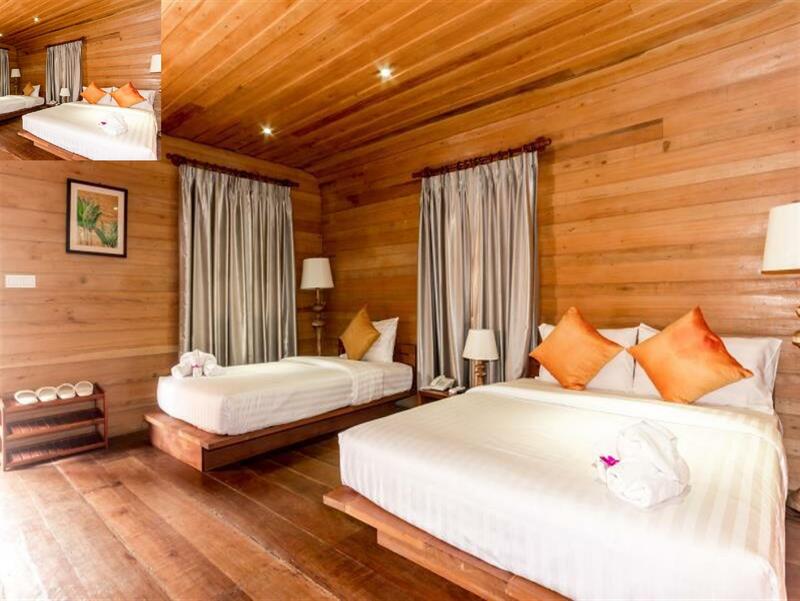 Being slightly further out was worth is for a boutique style stay in Siem Reap. The accommodation is by a busy road but you eventually de-sensitise to the sound of the road and just lap up the sound of the wildlife in the gardens of the property. Highly recommended. Stayed for 4nights in Nov. Amazing service; felt like a true vacation. Kids loved the pool in front of the bungalow, the breakfast was sumptuous and they boxed it for us when we went to see sunrise at Angkor Wat. Tropical setting. Installed Grab app for getting tuk tuk, which was convenient for getting around. The place is right across from phare the Cambodian circus (great show, btw) and you hear the music from it at night. Highly recommended. 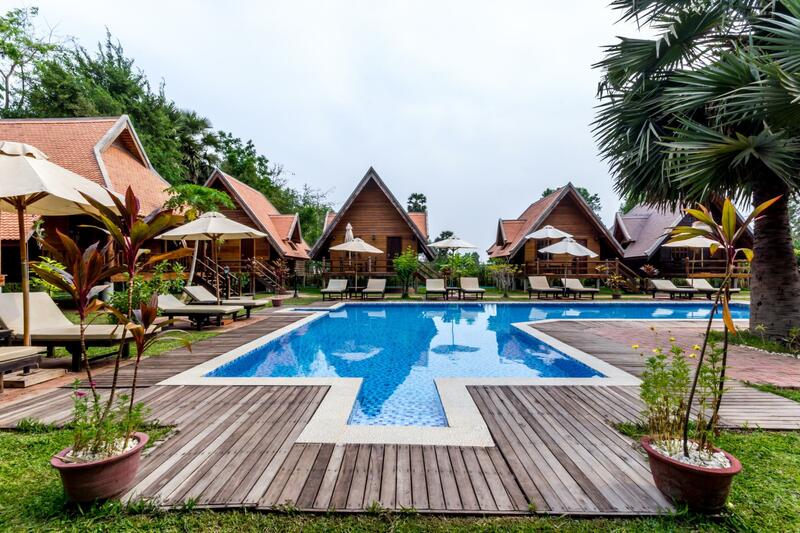 Traveling throughout Cambodia, Angkor Heart Bungalow was by far the best place we stayed at. The staff is incredibly accommodating. One of our bags didn't make it, but they were able to contact the airport and have it delivered the next day. They also helped us plan our temple tour for the day and arranged a driver, Siem, to show us around. Siem was the best! When we got back to the bungalow, they brought fresh coconuts to our doorstep to refresh us. The breakfast menu in the morning is the biggest/best we had while traveling. Highly, highly recommend this place. This place is awesome! All the staffs are super friendly and helpful. The hotel also provide free tuktuk and one way airport transfer. In the evening, they even provided us with fresh coconut. The room is clean and spacious. Highly recommended. My family stayed here for 3nights. We had a wonderful time. Nice breakfast, comfortable room, lovely pool and kind staffs.